Credits: NASA/Johns Hopkins University Applied Physics Laboratory/Carnegie Institution of Washington and Dr Paolo C. Fienga/LXTT/IPF for the additional process. and color. Even though - as you should already know - the NASA - MESSENGER Spacecraft's remaining "working time" is - litterally - running out, the Probe will continue to acquire new data sets and transmit them back to Earth during its final days. 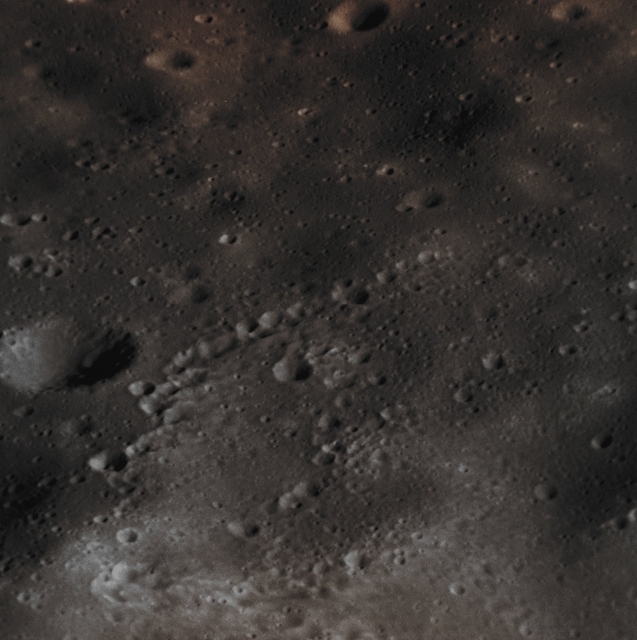 Shown here is a High-Resolution view of a Crater-Chain (probably caused by a Cometary Impact) that was snapped near the Heemskerck Rupes, which were so named after the Dutch ship that explored Australia and New Zealand during the AD 1642 and 1643. The total number of images that the Mercury Dual Imaging System (or "MDIS", for short) has acquired and returned to Earth since the Spacecraft entered into Mercury's orbit (such as on March 2011) is now 277.447, which is way more than originally planned for the NASA - MESSENGER Spacecraft's one-year (so-called) "Primary Mission". In the next few days, approximately 500 additional images are planned to be received back to Earth, though the NASA - MESSENGER Spacecraft is expected to impact the Innermost Planet of the Solar System on April 30, 2015, with more than a thousand images still on its recorder (images that - unfortunately - shall never be sent to Earth and therefore never seen by us). This picture (which is crop taken from an Original NASA - MESSENGER Spacecraft's b/w and NON Map-Projected image published on the NASA - Planetary Photojournal with the ID n. PIA 19438) has been additionally processed, contrast enhanced, Gamma corrected, magnified to aid the visibility of the details and then colorized in Absolute Natural Colors (such as the colors that a human eye would actually perceive if someone were onboard the NASA - MESSENGER Spacecraft and then looked outside, towards the Surface of Mercury), by using an original technique created - and, in time, dramatically improved - by the Lunar Explorer Italia Team. Different colors, as well as different shades of the same color, mean, among other things, the existence of different Elements (Minerals) present on the Surface of Mercury, each having a different Albedo (---> Reflectivity) and Chemical Composition.